This article is adapted from tips4me.com. You can find the original here. It isn’t appropriate to criticize or teach your partner on the dance floor. If someone doesn’t get a move, try it a second or third time, but don’t keep doing it over and over, or try to teach it to them. Unless they ask. While dancing it’s a common courtesy, if you bump into someone or step onto their feet, to apologize before you move on. Air steps, lifts, drops, etc. 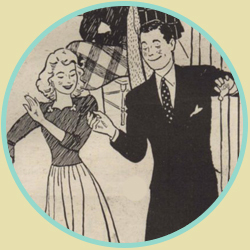 are not considered appropriate for social dancing at any time. You could put your yourself or your partner in danger, plus other dancers in the vicinity. You can showcase these flashy air steps in performances, competitions or “Jam Circles”. There’s nothing wrong with saying “no” to a dance, especially if you feel uncomfortable! And if someone tells you “no”, just move on and ask someone else. That said, we try to foster an inclusive, welcoming scene where we dance with everyone regardless of their skill level. It is considered the worst possible etiquette to accept an invitation to dance to a song after declining an invitation to the same song by someone else. Don’t stare at your partner, but don’t be shy about making eye contact or throwing them a smile. While dancing focus on your partner, make him/her feel comfortable; if you know for a fact that your partner has less experience than you, then dance to their level! 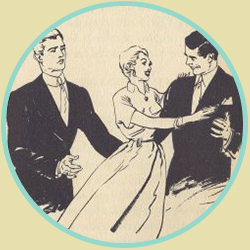 Don’t forget simple courteous statements like a ‘Thank-You’ after finishing a dance. Thanks to our friends at Red Hot Swing and Swing Dance Calgary for finding such an articulate, complete article about an important topic. Interrupting an instructor in front of a class is usually never good. If you wish to bring up a point that may help the instructor convey a message to the class, bring it up at a transition point, one-on-one, or raise your hand. During class, do not contradict the instructor’s teachings to other students. Bring up your disagreement with the instructor one-on-one as soon as appropriate. It’s OK to request songs for a DJ to play! However, trust that your DJ is experienced and has a reason to every song they play. If your song doesn’t get played, don’t be offended! The request might have come late, or it doesn’t flow with their set, or truth be told, maybe they just don’t dig it. It’s easy to forget about the people playing the music. Clap for the musicians, especially when they nail a solo or create a masterful performance! Aerials can be very dangerous. Learn them with a partner who’s willing to do them and trusts that you’ll keep them safe. Aerials are not done during social dancing with just anyone: they are done for performances, competitions, and sometimes jam circles.